“I’ve always been inspired by the spirit of clay,” says Senora Lynch, an artist from the Haliwa-Saponi Indian Tribe, who calls her pottery Living Traditions. Lynch became interested in making pottery at the age of fourteen, when she assisted her tribe’s elders with a pottery class. Years later, Senora met a tribal potter who agreed to teach her the craft of hand-coiling, thus renewing her interest, and creating her own style of hand carved pottery. She’s been a potter ever since. Old sayings and stories from the Haliwa-Saponi inspire Lynch’s unique designs, as does the natural environment. Lynch creates her pottery at home using the traditional hand-coiling method. First, she pounds red clay and rolls it into long ropes. Next, she coils the ropes and stacks them to form the desired vessel’s shape, which is done by pressing them together. She then smoothes the clay with her fingers and scrapes it with a tool to make the coils stick together. She continues to smooth and stretch the coils with her fingers. Finally, she polishes the vessel with a rock to make it smooth and shiny. To create a design, Lynch places white clay on top of the red clay and uses a tool to etch beautiful patterns. The vessel is then fired in a kiln. The process results in exquisite pottery which has been exhibited at the North Carolina Museum of History, 1996 Olympic Games in Atlanta, Smithsonian National Museum of the American Indian and the National Museum of Women in the Arts. In 2007 she was awarded for the NC Folk Heritage Award for her work in promoting and preserving the culture of the Haliwa-Saponi people. 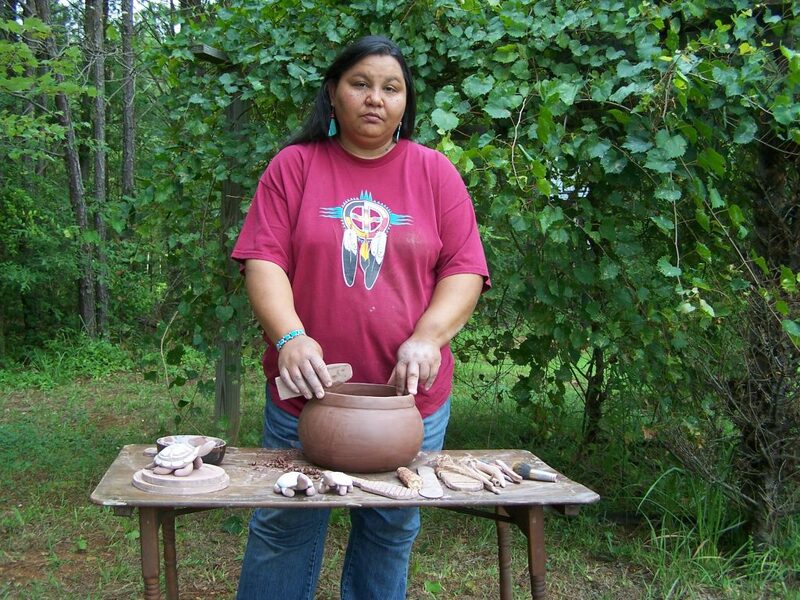 She has also been the subject of a book, The Contemporary Southeastern Pottery of Haliwa-Saponi Artist Senora Lynch. Lynch is married to Dalton Lynch and has one daughter, Elizabeth Qua Lynch. The Gift is a piece of work by noted American Indian artist Senora Lynch. The Gift was created and installed in two phases. The first phase was completed in 2004 with the second phase being completed in 2014. 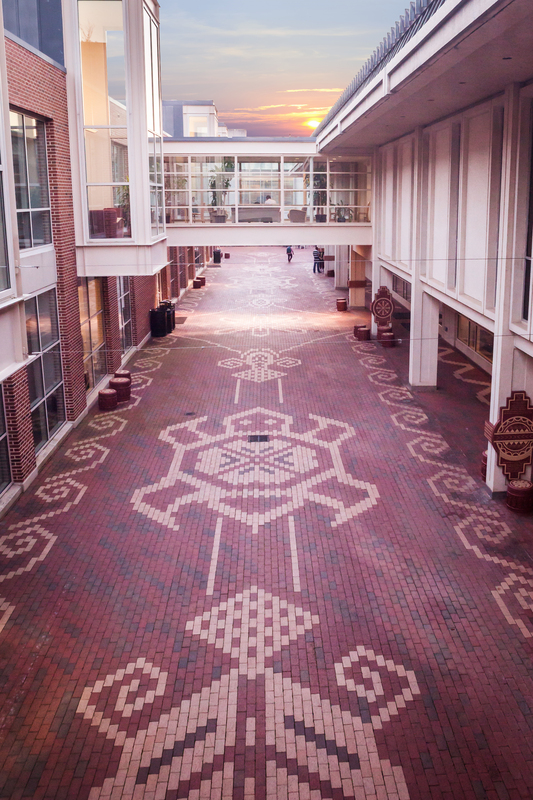 The design incorporates imagery from Native American storytelling and the natural world. The artist invites you to walk along the path, sit on a stool, search out the symbols, and consider the ways they connect to your life. The open ends represent the path of life each element represents a gift from the Creator. The crisscross pattern illustrates that life is plentiful and good and that we are provided with all that we need for survival. Corn is known as the staff of life, once the main source of food for Native Americans, and also a major agricultural product in North Carolina. The turtle represents life itself as well as the children of the next generation. It is the gift of the earth and the moon and represents a long life. The dogwood flower symbolizes springtime, a new beginning, a time to begin to till the land and prepare for the year to come. The hills represent the homeland, and the earth that sustains us. Water cleanses and purifies, bringing growth to all things. The eagle feather is a shield of honor the highest honor one can receive. It is bestowed upon those who have made a difference in their community. The four directions symbolize the earth, wind, fire, and water. They also remind us that each of us has been the power to choose the path we take in life. “The first thing I think of when looking at this piece is the concept of unity. 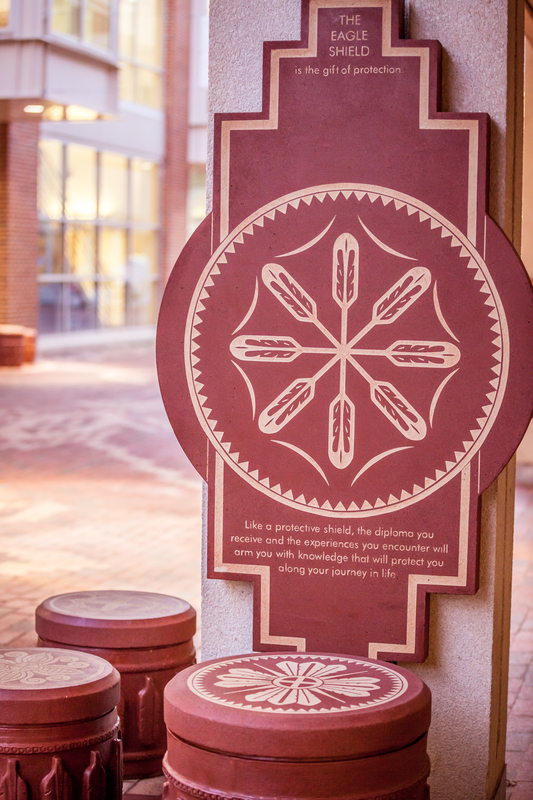 This gift came to life through the participation of various groups, including the Carolina Union, representatives from Clearscapes, the brick masons, various Native American faculty, staff, and students. 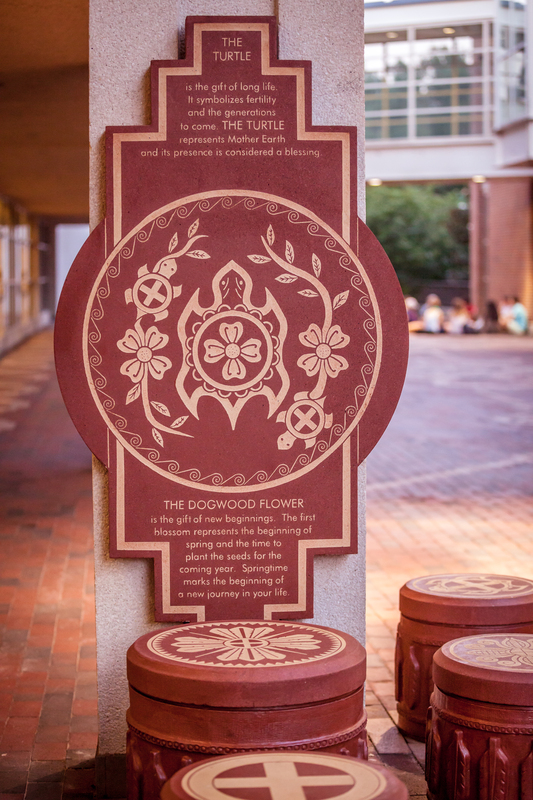 The Gift was designed by Lynch (b.1963) of the Haliwa-Saponi Indian Tribe, North Carolina. She is nationally known for her unique style of extraordinarily detailed hand carved pottery. Lynch builds her pots using the traditional coiling method, while decorating her work with Native American symbols and motifs of her childhood, while growing up in the homeland of her people “the meadows” Hollister, NC. Her pottery has been displayed at the National Museum of Women in the Arts in Washington, DC. She has work on permanent display at the Museum of History in Raleigh, North Carolina, and is also in the collection of the Smithsonian’s National Museum of the American Indian in Washington, DC.